As you walk into a bunker, don't just look at your lie - use your feet to get a feel for the sand. How soft is it, and how deep do your feet sink before hitting the firm base of sand? Pay particular attention to the area immediately behind your ball. Often when you see a Tour pro hit a sand shot that flies well past the pin, and then see him look quizzically down at the sand, what has happened is that the sand under his ball was less deep than it was in the area of his stance. He probably made a good swing for the lie he thought he had. 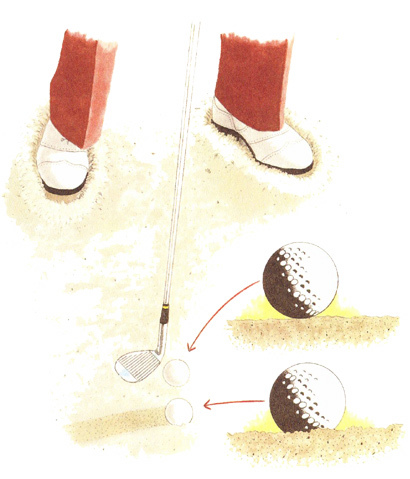 So as you settle in over the ball, grind your spikes into the sand, both to get a firm footing and to get a feel for the sand in the vicinity of your ball. Take note of the condition of the sand. If recent rain has compacted it, you won't have to hit the ball as hard as if the sand is dry and fluffy. Sometimes you can get a hint at the sand softness by taking a close look at the lie of your ball. If it's sitting completely atop the sand and has left no track in rolling to its lie, then you're on hard, probably crusty sand that won't require a hard swing. If the ball is sitting down and has produced a bit of a trough before coming to rest, the sand is probably soft and you'll have to put a bit of extra force into your swing.